About Jenness > NewsBlog > General > Had a BLAST at OC! Jenness went back to her “Music” Alma Mater of Odessa College Tuesday, Feb 6, to talk to the Music Department Students during their new Tuesday Seminar Series, “Grit.” The subject matter of the text is that “Talent isn’t everything, it takes grit to be successful,” on their second week of seminars, Eric Baker, OC’s Music Department Chair and Leader of the Cover Band, Current Nine (who performed with Jenness during her “It’s Time” Concert the week before). Jenness shared stories about her initial introduction to the then new Choir Director, David Corman (who also participated with Jenness in her Concert), who had just stopped his professional opera performance tours to teach choir and voice in the college, and her “immediate placement” in the program full-throttle. 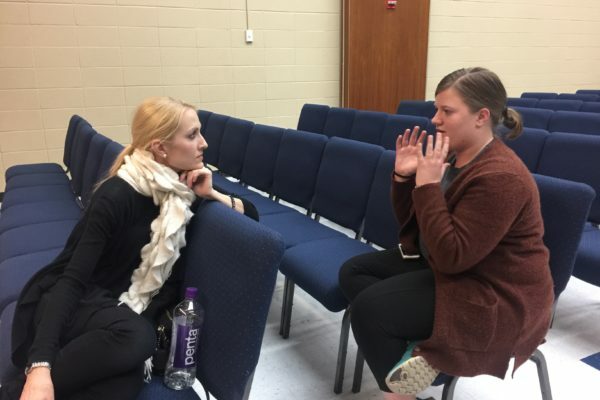 She then proceeded to share her phobia of stage-fright that Corman “beat” out of her with continual exposure, including a lead role in their opera, solos, and “section leader” to sing the part of her section to the entire choir. 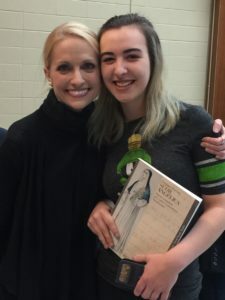 Photograph of Jenness with the student, who will be portraying the lead Princess Role in their upcoming Spring opera of “Sister Angelica,” the same role Jenness was given in her first interview with Corman. The is the Second Time the Choir will be doing this piece. The class took a sentimental turn when Jenness shared the backturn of her health during her second year in school, and how her desire to complete her then bachelor’s degree, kept her mind focused away from the direness of her illness, which at the time had only recently been diagnosed as advanced Lyme Disease with extreme complications of systemic organ failure. She explained how the OC music department rallied around her to aid her in completing the final hours of credit needed for degree completion, setting up a Skype Camera (which was a relatively new internet feature), and with David Corman and accompanist, LuAnn Lane, driving 30 minutes to her home to rehearse with her one-on-one in the weeks leading up to the concert. To close, Jenness was asked to sing for the students, which she did with LuAnn at the piano playing her staple piece, “Send in the Clowns,” by Stephen Sondheim. Jenness remained afterwards to visit one-on-one with several students to encourage them to face their life’s obstacles head on in order to accomplish their dreams. Featured Photograph Above: Jenness remains afterwards to chat with individual students one-on-one.